In my attempts to find the best pie in my local area around Gloucester I had to try The Queen's Head on the edge of the city. Very highly regarded, it is best to book in advance for dinner as it can get booked up. What is so good about the Queen's Head is that they don't try and be pretencious, they just do traditional British classics very well. They also do generous portions for the price, in particular, their signature Longford Lamb is difficult to polish off. However, they don't actually normally have pie on the menu which had always seemed a crying shame to me. 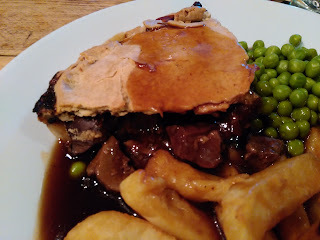 So I was delighted when I went for a weekday lunch and found that Steak & Kidney pie was on the lunch menu. I had no choice but to sample their pastry creation. But maybe there is a reason The Queen's Head don't serve pie on their brilliant dinner menu. It simply wasn't very good and it seems they have no idea what is needed to make a good pie. They won't be challenging the best pies in Gloucestershire that is for sure. The first basic error they made was smoothering the whole thing in a generic gravy. A common complaint from us on Pierate, gravy really needs to be on the side. It didn't really complement the pie and also made it all very soggy. The second basic error was to go for a slice of pie rather than an individual pie. Whilst this does meet our pie definition (and is much better than a casserole with a pastry lid) it just isn't what I am looking for in the Ultimate Pie, it just isn't as satisfying. The pie was well filled with meat chunks but had quite a high proportion of kidney. I have never in my life come across anyone who prefers kidney to steak so this ratio could have been better if it was more bias towards the steak. The meat was quite tasty if a bit chewy in places. The pastry also tasted nice but was thick and had a bit of a weird texture, perhaps due to the gravy bath it was sat in. I found the pastry sticking to the roof of my mouth. Overall, sadly more negatives than positives and this pie really didn't live up to expectations. There are much better pies in the local area.